The Mill and Blue Hive deliver a 30 second spot for Ford that will have you holding your breath, directed by Martin Campbell. Blue Hive, Black Label and Bond director Martin Campbell got together with The Mill for Ford's 'Man dives through Ford B-MAX!' advert 'Dive'. And that's exactly what happens in it. 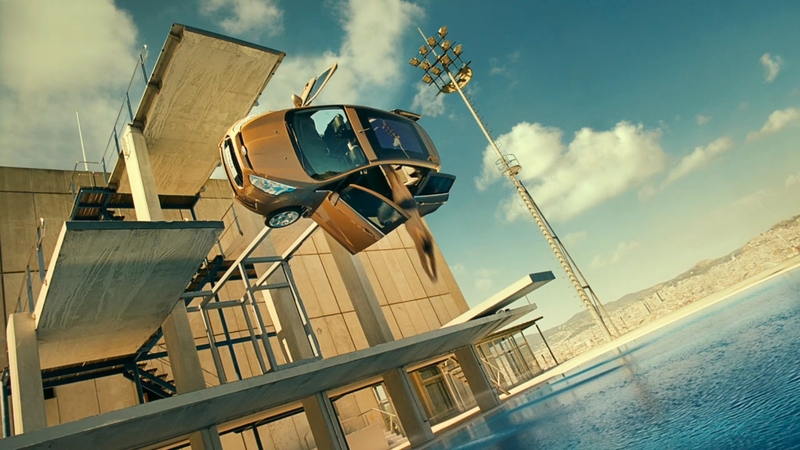 A stuntman jumps off a diving board, through a car and into a swimming pool. And it made quite a splash. "This was a great way to showcase how much room there is inside the pillar free Ford B Max." says Mill VFX Producer Chris Batten. "Bond stunt man Bobby Holland-Hanton dived though the car for real on set in Barcelona." "It was great fun working with Martin on the project" says Mill lead 2D artist Jay Bandlish, "he had a clear vision of how he wanted it to look and how to get there. I dived off the 7.5m board which was scary enough as a practise on set. But diving from the 10m board with a car in between is totally amazing. What a stunt."